Now that we are finally enjoying some beach and picnic weather, I thought it would be a good time to celebrate that most famous of portable meals…the sandwich! Are you a sandwich fan? Of course you are. The beautiful thing about sandwiches is that they are for everyone – young or old, rich or poor, peckish or famished. Whatever or whoever you are, right now there is a sandwich with your name on it. Not sure what you’re in the mood for? 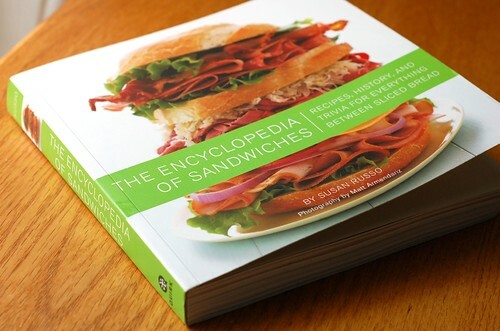 I suggest you peruse the informative, entertaining, and beautifully photographed new book “The Encyclopedia of Sandwiches” by Susan Russo, with photos by Matt Armendariz. Susan pens terrific the Food Blogga and also writes for NPR Kitchen Window while Matt was one of the wonderful and seriously talented speakers I met when I attended Food Blog Camp in Mexico. This book is right up my alley…portable, crammed with historical fun facts, full of bright photos, and inspiring enough to make me hungry. It covers the basics (peanut butter and jelly, egg salad, grilled cheese, hamburger), the adventurous (egg and pepper, Spamwich, prosciutto and fig, Dagwood), the mysterious (muffuletta, Croque Monsieur, Bánh Mi, Jucy Lucy) and the just plain magnificent (banana split, baked bean, frittata, ice cream). I was only on the C’s when I started making my grocery list. 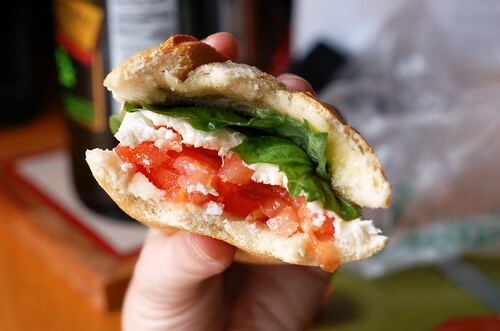 Behold my first EOS-inspired lunch – the Caprese sandwich! It couldn’t be simpler, but simple is all you need for one seriously delicious sandwich. 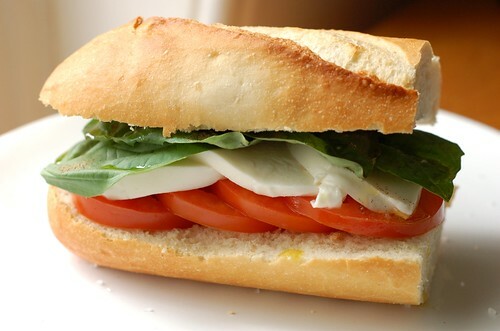 Split a crusty baguette and layer on the plum tomatoes. Then fresh basil, salt, pepper, and drizzle of olive oil. …then close your eyes and experience sandwich heaven in the form of juicy tomatoes, creamy mozzarella, and aromatic basil. Within a crusty baguette, of course. This is a sandwich, after all. 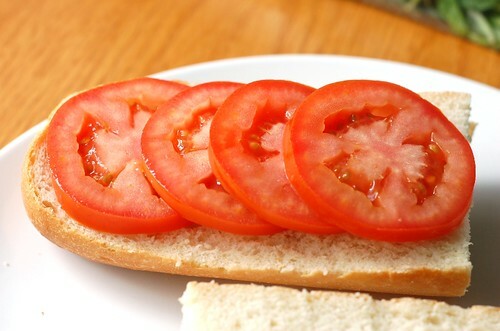 I can’t wait to eat these all summer with fresh tomatoes. Are you thinking about your favorite sandwich now? What is it? Stay tuned for more of my favorite sandwiches this summer! The kind folks at Quirk books sent me a copy of The Encyclopedia of Sandwiches to review, but as always, all opinions expressed are entirely my own! ohhhhh that is, by far, my all time favorite sandwich!!!!!! Gorgeous photos…I love the rogue drop of olive oil on the bottom half of the bread…beautiful! 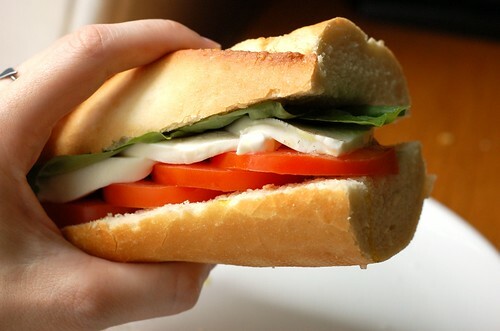 Ooh I love caprese sandwiches. I have that book as well and still need to find some time to make some of the sandwiches from it and give it a proper review! Yum! Can’t wait to see the other sandwiches you come up with. My favorite right now is one I’ve been eating for lunch all week. Whole wheat bread, avocado, white bean puree, sprouts, lettuce and a tiny amount of red onion. That sandwich looks so fresh and tasty. 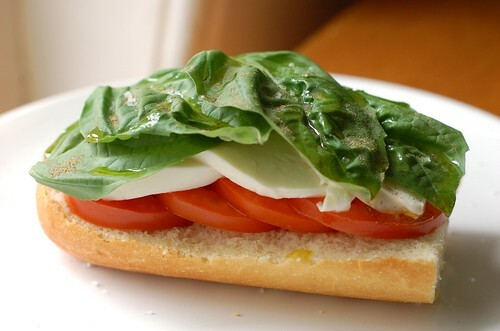 Caprese salad is the bomb, so I bet it translates well on a sammy! that bread looks SO GOOD. I am craving a sandwich now. My sandwich is a twist on a BLT to which I add avocado. I think I could eat this everyday and not get sick of it. So simple, yet delicious! 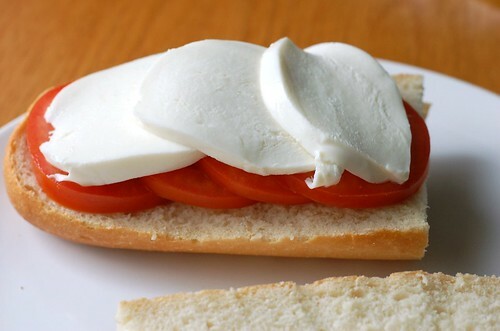 Fresh mozzarella is the best addition to any sandwich! !